Abies procera, the Noble fir, also called red firand Christmas tree, is a western North American fir, native to the Cascade Range and Coast Range mountains of extreme northwest California and western Oregon and Washington in the United States. It is a high altitude tree, typically occurring at (980–4,900 ft) altitude, only rarely reaching tree line. Description: Abies procera is a large evergreen tree typically up to 40–70 m (130–230 ft.) tall and 2 m (6.5 ft.) trunk diameter, rarely to 295 ft. tall and 8.9 ft. diameter, a narrow conic crown. The bark on young trees is smooth and gray with resin blisters, becoming red-brown, rough and fissured on old trees. The leaves are needle-like, 1-3.5 cm long, glaucous blue-green above and below with strong stomatal bands, and a blunt to notched tip. They are arranged spirally on the shoot, but twisted slightly s-shaped to be upcurved above the shoot. The cones are erect, (4.3–8.7 in) long, with the purple scales almost completely hidden by the long exerted yellow-green bract scales; ripening brown and disintegrating to release the winged seeds in fall. Abies procera is very closely related to red fir (Abies magnifica), which replaces it farther southeast in southernmost Oregon and California, being best distinguished by the leaves having a groove along the midrib on the upper side; red fir does not show this. Red fir also tends to have the leaves less closely packed, with the shoot bark visible between the leaves, whereas the shoot is largely hidden in noble fir. 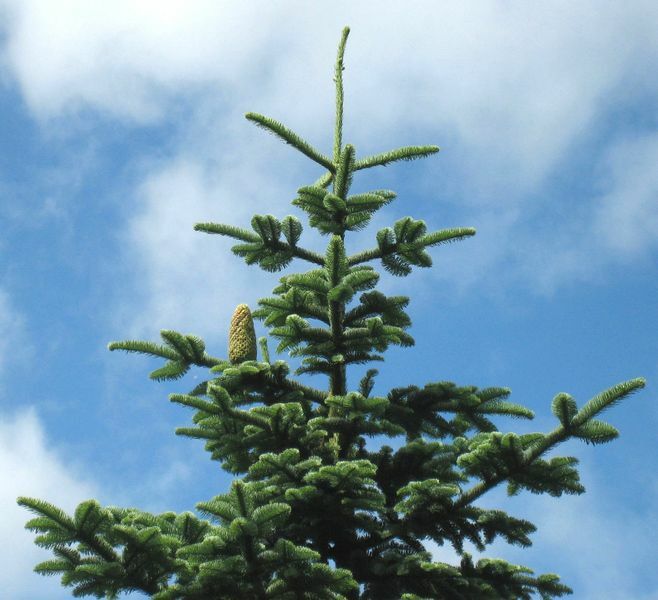 Red fir cones also mostly have shorter bracts, except in Abies magnifica var. shastensis; this variety is considered by some botanists to be a hybrid between noble fir and red fir. Uses: Noble fir is a popular Christmas tree. This plant has gained the Royal Horticultural Society's Award of Garden Merit. The wood is used for general structural purposes and paper manufacture.